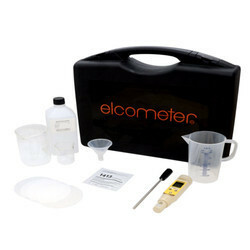 Manufacturer of a wide range of products which include elcometer 138 bresle salt kit, bresle salt kit, elcometer 138/2 surface contamination kit and brookfield ct3 standard probe kit. 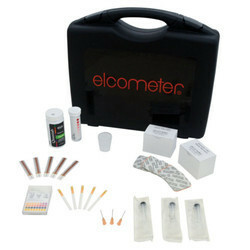 The Elcometer 138 Bresle Kit includes the Elcometer 138 Conductivity Meter. This lightweight, portable conductivity meter accurately measures the salinity of the test samples. The sensor cartridge can be easily replaced when necessary and displays conductivity in a range of units including: S/cm, S/m, ppm and % salinity. Dimensions 300 x 220 x 75mm (11 x 8.6 x 3"
Our company is the major company known for providing Bresle Salt Kit to the clients. This product is suitable for use in the field to determine the presence of soluble contaminants before painting or a similar treatment. Offered range is mainly directly proportional to the concentration of dissolved chloride ions in the solution. 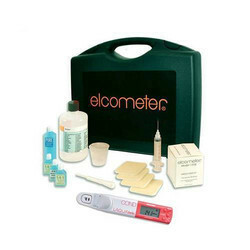 Features of the meter include indication of stability of reading indication. Measuring the level of contaminants on a surface prior to application of the coating is essential to ensure the quality of the coating and that its optimum lifetime is achieved. If the coating is applied to a contaminated surface, which is not properly prepared, it could fail prematurely resulting in costly recoating and high maintenance costs. 4mm dia cylindrical probe storage case.